It looks like Paul Pogba transfer speculation is set to dominate the headlines for the next few months as talk grows that the Manchester United midfielder wants out of Old Trafford. A worrying report from AS today claims Pogba has rejected the chance to sign a new contract with Man Utd as he wants a move to either Spain or Italy and has his agent Mino Raiola working on it. This report follows other similar stories as this saga gathers pace, with Marca reporting that the France international is specifically keen on joining Real Madrid, while Don Balon suggest he could be keen to rejoin Juventus. It remains to be seen if United will actually let their in-form man go, but one imagines they might want to have some replacements in mind just in case. 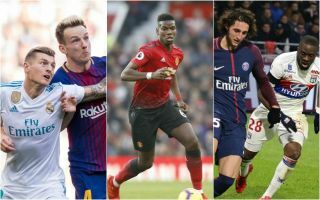 Tanguy Ndombele to Manchester United to replace Paul Pogba? Recently linked with United by Calciomercato, it’s been suggested in their report that Premier League suitors could have an edge over the likes of Juventus in the hunt for Tanguy Ndombele. After some sensational form in Ligue 1, the young Frenchman is likely to be expensive, which shouldn’t be too much of an obstacle for United, even if it is for others. A similarly strong, skilful and intelligent box-to-box player to Pogba, Ndombele looks set for a great career and could easily make sure MUFC don’t miss their star man too much. Possibly available for around £50million this summer, a move to Manchester United has once again been talked up in the press. A long-time target of the Red Devils, Toni Kroos’ Real Madrid future now looks in doubt, according to the Sun, with a £50m move to Old Trafford perhaps on the cards. On top of that, bookies have responded to the story by cutting odds on the Germany international making Man Utd his next club.